1. I look tired because I am... week at camp w/ the youth, away from my fam + coming home to all three of us sick (the littlest w/ a double ear infection) + 7am alarm every morning in the tune of hammers and saws in my back yard + the obvious of being pregnant. yup. i'm tired. Make sure you keep up w/ your style profile -- updating your sizes to what you think will be best. 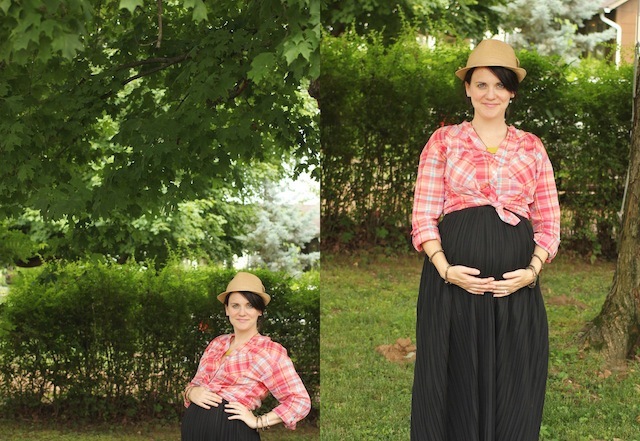 Go for items that can be worn pregnant or afterwards. Think button ups that can be tied above the bump or worn normal later. Usually you only get one accessory per fix, but ask for them to send more. And don't be afraid to tell them exactly what you want or to request specific items you have seen on their blog or instagram. Maxi skirts & dresses, summer cardigans, long light weight tanks... these are things you can't go wrong with this summer if pregnant. Leave detailed reviews of your items. It helps you and it helps others too! So if you get a dress that would just totally not work during pregnancy, let them know. They want to hear that stuff. It helps them serve better... and hey, it will probably mean they will know not to send it to me either! If you haven't signed up for Stitch Fix you can do it HERE. There is a bit of a waiting list (usually 2-3 weeks to get your official invite to get started), so you'll want to go ahead and bounce on this. To read more about stitch fix works you can check out this post of mine, or shoot me an email. 4. Notice some dirt mounds in the pictures. I think we have identified some Pocket Gophers in our yard. They have been terrorizing us for two years. Not cool. you look beautiful! can't wait to see that baby you're growing in there! You had me at the plaid. Precious. Gah! You are so cute with your baby bump. Love your bloggy....following. You look fabulous!! That baby bump is to die for. Love your blog & style! Great look and such a pretty color top!